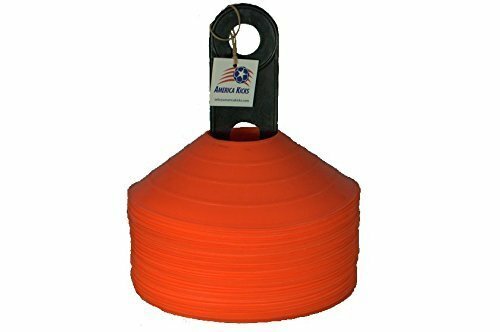 Reehut Disc Training Cones - Makes You Have Fun! Reehut Disc cones will meet all your needs. Made from environmentally PE material, non-toxic and tasteless. Built to last and designed for safety. 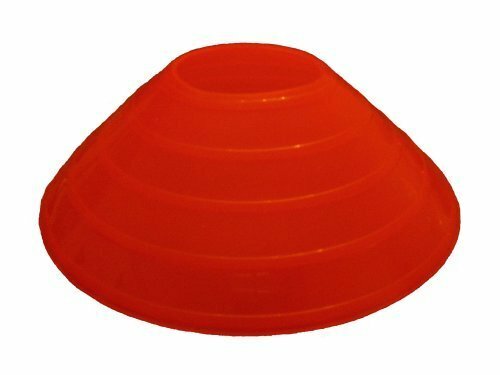 Why Choose Reehut Agility Cone Set? - Fits for Skating/Skateboard/Soccer/Outdoor activities/Traffic,etc. - For backyard, schools, units, organizations large events, residential parking, etc. Reehut Disc Cone - maximize your acceleration, deceleration and agility! Included - Set of 25 cones with dimensions of 2 inches high, diameter 7.7 inches each. Material - Made of soft plastic (LDPE - Low Density Poly Ethylene) , durable and won't crack or fade. Convenience - Stackable for easy to carry and storage in stand holder. Bonus - FREE 22 PAGE E-BOOK to show you how to improve your acceleration, deceleration and agility. Visible & Multipurpose - Bright colors provide clear visibility during training. Can be used for side-line / boundary markers, speed agility drills, obstacles, targets and etc. Exclusive service: All REEHUT products are backed by a 30-day replacement or refund, a two-year warranty and lifetime customer support. If you have any questions, please feel free to contact us and enjoy your exclusive service. In every sport and at all ages, Speed and agility movement are some of the basic skills required by any athlete at any age, So If you re serious about performance & conquering the field, you should set your goals ahead, and purchase only effective training gear to maximize your efforts. What s Included in the Set? 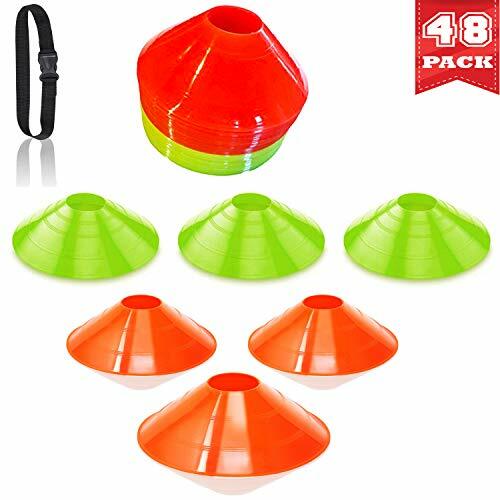 56 Pro Agility Disc Cones Durable Plastic Cone Caddy Mesh Drawstring Sports Carry Bag Bonus gift  What the cones are good for? Improve your ability to quickly accelerate, decelerate, and change direction. Mark off boundary lines for sport specific drills, games and scrimmages Set up obstacle courses for RC cars, kids, races, bikes, drones, dogs or motorcycles, skaters course, football, basketball, team sports, CrossFit sessions Our ultra bright Agility cones can t be missed for miles - and they won t trip you over. When you re done with your workout, just stack them up and place them back in the bag for easy carrying and storage. BONUS! Order now and for and get the top 25 cone Drills for kids eBook for FREE! Click on ADD TO CART and get your soccer cones today! OUR PROMISE TO YOU! - FREE RISK - NO-QUESTIONS-ASKED - 100% MONEY BACK GUARANTEE- If you find yourself unsatisfied for any reason, we will refund your purchase within 24 hours. It's that simple-guaranteed. 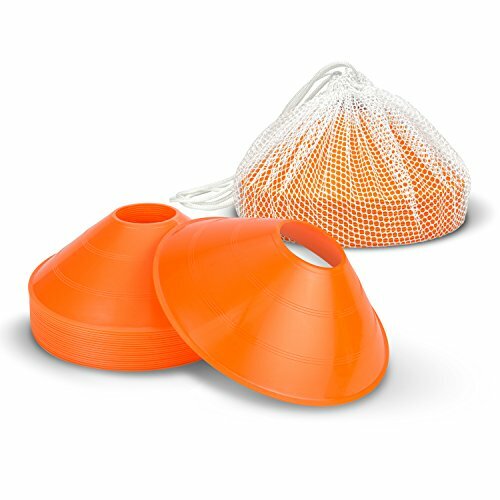 PRO TRAINING SET - Your new agility disc cone set will include 56 Pro Disc Cones, mesh carrying bag, cone holder, and Bonus "Top 25 Speed and Agility Cone Drills" eBook. 100% MONEY-BACK GUARANTEE - Bltzpro Sports offers a 100% guarantee that you are fully satisfied with your Pro Disc Cones or receive your money back. Hit Add To Cart now. Size: 7" x 5.1" x 5.1"
Set of 20, 5 colors(Red, Yellow, Blue, Green, Orange), 4 in each color. Our traffic cones are made of high-quality vinyl, thicker and durable, they won't crack or fade even under conditions from -20 to 50 . Each cone measures 7 inches in height, 5.1 inches in length, 5.1 inches in width. Four holes on it for attachment. The cones are used for any outdoor and indoor activities, such as soccer, football, basketball training. Also they are perfect for party decorations, bicycle obstacle course, motorcycle training, dog training, horse training or etc. Children can spark fun and creative connections with other ones while enjoying essential hours of exciting playtime with friends and family. No coach should be without this set of 50 marking cones, an essential at no matter what level you coach. At this price no coach can do without. Bright orange, they can be used for many activities and games. Use for drills, sideline/boundary markers, obstacles, targets. 2" high. Stackable for easy storage. Set of 50 with holder. 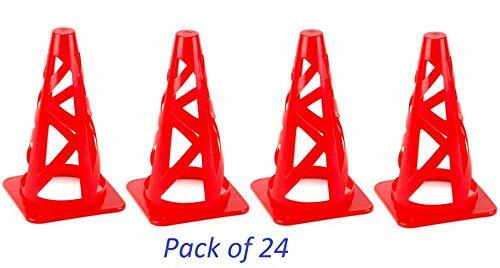 Each cone measures 4 in W x 4 in L x 2 in H. Sold as a set of 10 cones that are easy to stack and carry for your convenience. KamelKone has your next activity in mind when we made this cone. We designed and manufactured this cone to be wind resistant and soft enough to compress. Flatter design is safer and durable too. Soccer drills? No problem. Training your children to ride their bikes in a parking lot? Make them an obstacle course. High school basketball coach looking for shooting markers? Don't bother with larger plastic cones that will be knocked around easily. Our cone is ideal for visibly marking your activity without getting in the way. Guaranteed to suit your training needs or your money back. 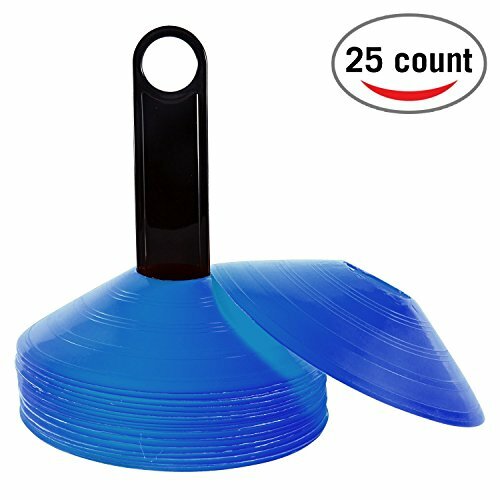 SET OF 10 SMALL CONES WITH A RUBBER LIKE TEXTURE AND WEIGHT means your soccer cones will not fly away when the wind picks up like regular disc cones. COMPACT, STACKABLE 2 INCH CONES will fit in any coach's training equipment bag. Each little cone measures 4 in W x 4 in L x 2 in H.
UV PROTECTED, BRIGHT ORANGE COLOR THAT IS FADE RESISTANT. Great for outdoor and indoor activities. GREAT CONES TO PRACTICE YOUR SHORT GAME, or as toys for fun and play. Step up your training today with a set of Go Sports training cones. 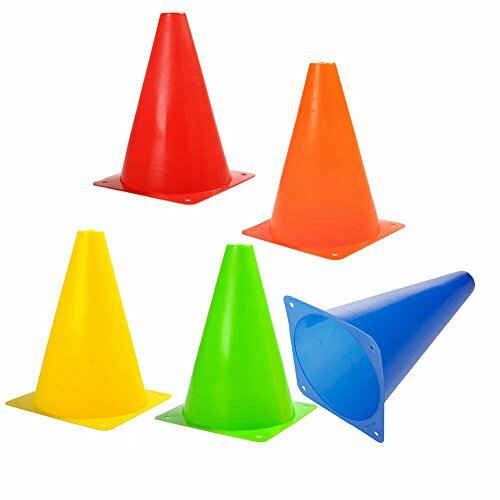 The set includes 20 training cones which are Great for individuals or team drills. Their low profile design and flexible construction means they are durable and extremely safe if anyone falls on one. Their high visibility orange color is Great for low light conditions. We also include a mesh tote bag so you can keep the cones organized and transport them with ease. The set comes with a full 1-year warranty for any damage or defects. No coach should be without marking cones, an essential at no matter what level you coach. At this price no coach can do without. Bright orange, they can be used for many activities and games. Use for drills, sideline/boundary markers, obstacles, targets. 2" high, set of 20. Stackable for easy storage. 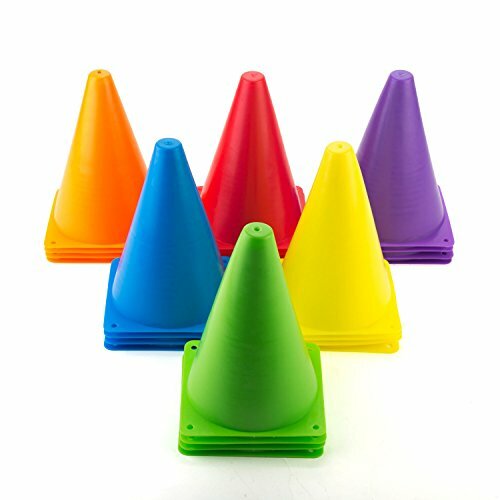 Cones are bright and colorful for easy visibility, made of flexible and durable vinyl. Cones stack easily for quick storage that saves space. Our long-lasting soccer cones will bounce back after getting stepped on, kicked, and run over season after season. Great as boundary markers, sport practice, and targets. Improve your ability to quickly accelerate, decelerate, and change direction.  VISIBLE COLORS - Bright, easy-to-see colors with UV protection, on the field, courtyards, track, sidelines, or parking lot. A great gift idea for kids, coaches, athletes, or sports lovers. Do not break even if you drive over it. The colors are bright and easy to recognize. The cones are quite small, but also good to store and transport. Ideal for football training, roller skating, soccer, kids cycling, coaching, drills, basketball dribbling, obstacle courses and other sports. 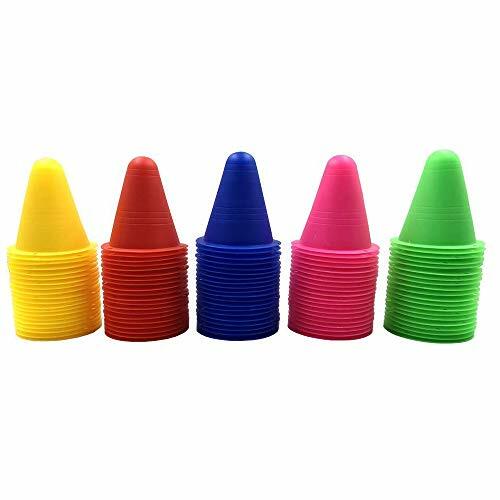 Included Set of 50 cones with dimensions of 3.07 inches high, diameter 3 inches each. Easy to take with them where they fit in any bag. Super Design Ideal for football training, roller skating, soccer, kids cycling, coaching, drills, basketball dribbling, obstacle courses and other sports. Useful and Robust Made of soft plastic, do not smell unpleasant like plastic, durable and flexible, do not break quickly even if you accidentally step on it. 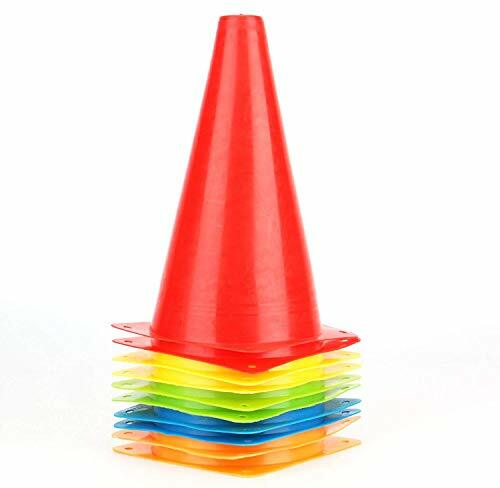 Cones are bright and colorful for easy visibility and stack easily for quick storage that saves space. 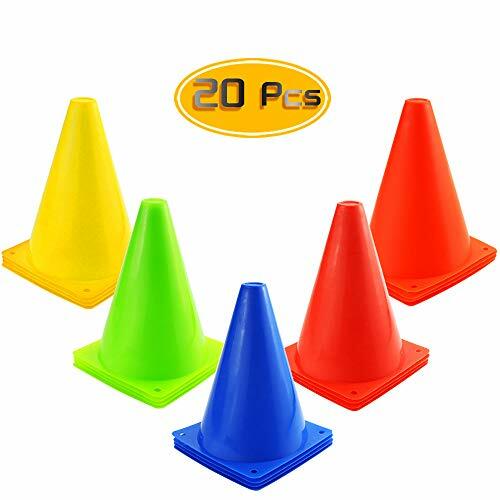 High Visibility colors 50 slalom cones in 5 different colors.The colors are well chosen and are easy to recognize even on meadows and the flat conical shape makes them clean even in windy conditions and will not be blown over. Suitable on the field, court, gym, track, sidelines, or parking lot. 30 Days Money Back Guarantee 100% refund for 30 days - no questions asked! To prove our confidence in the agility cones we provide and their value to you, we are offering a 30-day, money-back guarantee. Hit Add To Cart now. 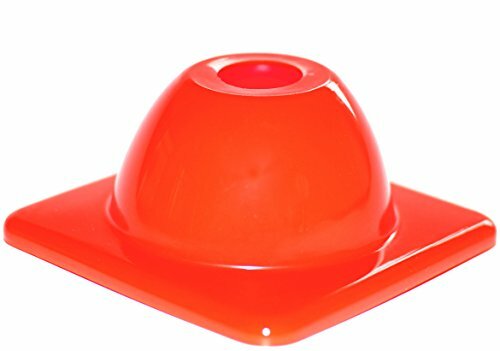 Set includes 10 plastic traffic orange cones, sports training and agility courses, fits for skating, soccer, outdoor activities. Designed for use on any surface - grass, concrete, gym floors, cement, artificial turf and more. Color: Bright red. Material: Quality durable plastic - Can be used to set up goal posts for a sports match, or a fun day event or game. Ideal for sports training, outdoor games or construction themed birthday party decorations. Marker cone can be used to mark boundaries or set up training courses.